I am, however, in favor of life. This doesn’t mean I’m in favor of it when it’s convenient and easy for me. This doesn’t mean that I’m in favor of it only when it means messing with other people’s lives and decisions and freedoms. This doesn’t mean I’m only in favor of it when it doesn’t cost me anything. I’m in favor of life. Period. No conditions. No ifs, ands, or buts… I’m PRO life. I’m in favor of nurture and fostering life in its many splendid ways and means… and I’m interested in promoting life in places where it hasn’t felt splendid and seems to have no ways or means to go forward and upward. Three years ago my ministry took an interesting turn. I was called to a new pastorate in Boise, Idaho. I’d never been there… didn’t know anyone there… didn’t really know where there was… but now here I am. However with that call I also became called out of the suburbs into an urban church. Maybe it’s not the biggest urban center… but it’s the biggest one around. (Our competition is mostly tumble weed.) Now I pastor a church that is one block from the capital building. Our life – 3 months of the year – is dominated by the legislative schedule and the conversations happening in the Idaho Senate and House. And that has been a learning and growing experience. What it has taught me is how to be really and truly pro life. It has challenged me to put myself “out there” and advocate for the social issues where I see life being held back rather than promoted and built up. It has challenged me to leave my comfort and be willing to be offensive now and then (though that is almost always also affirming to someone else) in the promotion of life. It also reminds me that I’m finite. While I wish to be at the state house advocating and adding my voice to the various issues of life I also still need to write sermons, cast vision, visit hospital rooms, study scripture, pray…. Oh yes, and be a loving spouse, partner in parenting, and loving (and boundary setting) parent. I can’t do it all. None of us can – and some handle that juggling better than me – and in there we all also need to rest… because rest promotes life. But I also make sure that I don’t use that finite-ness as an excuse not to be actively and tangibly and incarnationally pro life. So I have found myself at the state house more and more – and I finding myself wishing to be there even more than that. My twitter feed now focuses on advocacy issues, and my FB friend base grows by those who share those passions for the promotion of life. So a little more of how it feels to me to be pro life. I am in favor of a women’s right to her own health care. And I’m in favor of walking alongside her and listening to her and supporting her before I decide what is and isn’t true for her… if I ever presume to be able to decide such a thing (hint: I don’t). I’m pro life. Not my life lived through others – I’m pro- life in its many and splendid forms and while I wish that meant never having death, difficulty, disease, and hard hard choices between lives… that isn’t the world I live in. So in the meantime I wish to promote the lives of the people who have to live those stories. I’m pro-people… and that is always messy. I’m in favor of protecting people from discrimination. I’m in favor of protecting the legal standing of my neighbors. If they are gay, straight, transgender, religious, atheist, Asian, African, Jew, Arab… be they of whatever creed, race, sexual orientation, gender identity or lack thereof. I’m in favor of their life. I may not understand it. But again – I’m not in favor of them living MY LIFE. I’m not in favor of what i understand or what I don’t fear. I’m not in favor of deciding what their life should be or how they are “doing it wrong.” I’m in favor of them living their life. I’m in favor of them not being held back by my fears and norms and worldview. I’m in favor of them having the same opportunities and chances to flourish that I have. And I’m in favor of ensuring other people can’t deny them life and the right to flourish in the living of it. I’m pro life. So I’m pro increasing the minimum wage. I sat with a very able bodied 26 year old white male a few weeks ago. He’s straight and he’s trying to get his life straight. He should have it made, but like many of us – he made some bad choices. His bad choices had more consequences than mine. Mostly out of luck on my part. He’s working a minimum wage job for as many hours as he can get… and living in a homeless shelter unable to get enough money to get back into his own housing. I’m pro life for him. I don’t want him in that shelter. I wish he could make a living wage. I wish there was affordable housing. I wish… I wish to promote life. So I’m pro life and that means I’m pro living wage and I’m pro seeking ways for business and citizens and governments to create housing solutions for life even at our cost. And you heard so much more in there… I’m pro medical care for the homeless, and I’m pro treating mental illness and I’m pro treating addiction as a health problem. I’m pro health care and I’m pro giving up my privilege and excess and comfort to spread it around a little… and yes I’m pro taxes because as much as the government may mismanage them we will never be able to adequately promote life without a well-funded social and government structure. And I participate in government so that it will promote, protect, and advance the cause of life – in all its shapes and sizes. I’m pro life and that means I’m in favor of your life whatever country you were born in and I’m in favor of you seeking life in whatever country you may go to… you ought to have the same right to seek out life that do and I shouldn’t try to make that so dang blasted hard to figure out that you give up before it becomes real. And I’m pro food stamps and food pantries and welfare. Does it get abused? Absolutely. But I’m pro life and that means I’m indiscriminate with my love and care. I’m not in favor of the life of smart people or wise people or perfect people. I’m as pro life in the unwise, broken, poor, uneducated, and sometimes just plain obtuse… as frustrating as that can be, as I am for you and me. I’m willing to be taken advantage of in the promotion of life because that is how life works – wherever there is life there are parasites and I won’t kill the former to prevent the latter. If 9 people have to take advantage of me in order for me to promote one life that will be truly more abundant by my openness… than that one is worth the other 9… in fact, 99. Because… you guessed it. I’m pro life. I’m pro your life even if you don’t like the way I’m pro other’s lives. I will endeavor to have regard for you even as you dismiss me… at least I’ll try. Because I’m not perfect as being pro life any more than anyone else. But I will try… so I’m pro you – because I’m pro life. So let’s sit down, somewhere between legislative conversations and getting the kids to bed… and talk life together. Promote life together. Live life: together! Yesterday “marked” the beginning of the season of Lent. It also marked the beginning of another season. My sister Sally Kukla Taylor​ met with palliative care and was referred to hospice which they will be beginning in the next couple of days as the details are worked out. We do not know what the season will be, will it be harsh and cold and drawn out? Will it be soft and quiet and pure, will peace enfold quickly? Life has taught us it will be some of all of that, and something else entirely unexpected thrown in whether we are willing to receive it or not. My sister Sally has always been the strongest of us. She still is, though harsh winter makes that hard to see now for those who are not experienced in seeing it. Our family has a certain learned resilience that comes of repeated “winters.” So the family rallies to rearrange the house again for a whole new kind of hospital room to be erected in a place that was constructed for more happy occasions and entirely different family gatherings. But its okay. We didn’t choose this – who would!?! But we will survive what the winds blow our way – because we aren’t doing this alone. Because we have also learned that wonders are revealed like crystal works of art in an otherwise forbidding snow. And we will find those wonders together… as we walk a journey to peace and wholeness – an elusive but certain goal. And I guess I want to say one more thing as I process this all out loud. You have heard or will hear me say this again. I hate that we talk about fighting disease and illness and death. There is struggle. And surely there is a sense of fighting for energy and life and all that… But its not a fight. There is no winner and loser. If you are fighting death. You will lose. Any of us; all of us. If you are seeking life – in all that this may mean and in whatever spiritual or aspiritual tradition you practice – you will win. There comes a time when the life we seek is on the other side of death. It is not losing, or giving up, to acknowledge that. In fact its a certain kind of holy and blessed realization. Its hard. We don’t want it. But that day comes. Sally and my family aren’t there… yet. We are still carving out a place of life here and now. But we step quite tangibly with every new phase towards a day when we will coast downhill through death. And it will be okay, and it will not be losing. It will be sad, heart-wrenching, and it will make us question what comes next… but it will not be losing. It was be peace at last. If anyone has taught me that… Sally has. You are an inspiration to me – even if you were my enemy for the first 18 or so years of my life. I love my enemy! You got this, we got this – together until the end and beyond no matter what lies between us. 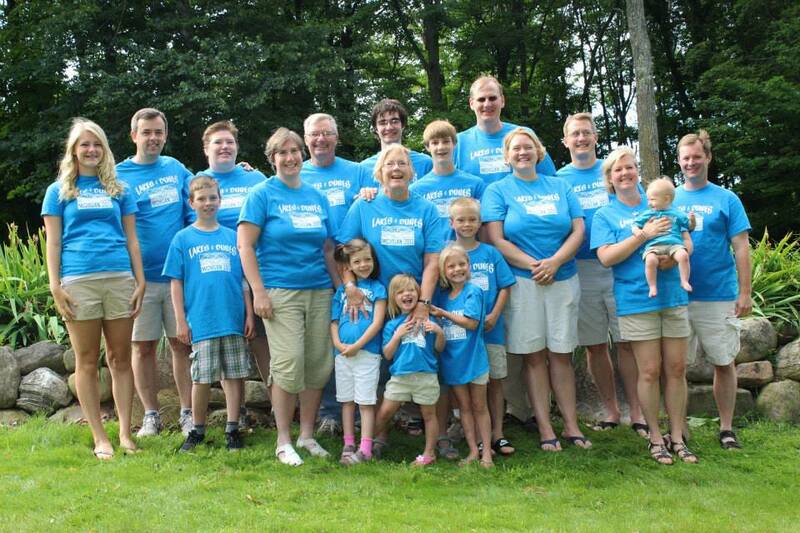 This is from the 2013 “Kukla family” gathering in Michigan. We vacation together every other year somewhere. This year it will be Estes Park, CO in early August. Tomorrow is the beginning of Lent. Lent is a time of preparation. A time of simplicity when we try to reduce the distractions, and a time of fasting when we can focus on what truly matters in life. It is a time of walking closely with Jesus as he makes his way to Jerusalem and the events of Holy Week including Maundy Thursday, Good Friday, and only after all of that… Easter. This year I’m thinking on the idea of RESET. I remember playing video games and sometimes you knew you weren’t doing well and so you decided to hit the reset button and start over. Its that ultimate ‘do-over’ moment of wanting to begin again with a clean slate. Sometimes real life gets out of control just like that. The busy-ness takes over, chaos holds sway and we are going in many different directions. One at a time we chose it all but now its. just. too. much… and in the midst of that whirlwind we need to cringe and we scream out: RESET. Sometimes we get going in the wrong direction. Our priorities are wrong, we aren’t even happy with our own decisions but we aren’t sure how to change it. We are ashamed and guilty of where we are or what we are doing but we keep going down the path… and inside we cry: RESET. Sometimes we find ourselves caught up in a big swell of activity from our community – school, work, friends, neighbors, the whole world around us – and we find ourselves overwhelmed by events around us and feeling helpless in the midst of them, one little fish in a great big sea… what can we possible do? And we whimper: reset. This year, let us use Lent as a time of reset – a time to take stock of where we are in life and where we wish to be, and reset the path that we are on: be re set by the Spirit on Jesus’ path. Do you need to hit reset? I will gather with many of you tomorrow as we mark this time of reset with Ash Wednesday. Ashes representing our sin and brokenness… ashes that mark our frailty and death, but we don’t stay with ashes. That is the reset, the turn. From ashes to table we are invited to let go that which binds us in shame and guilt and turn to God’s offering of grace and walk Jesus’ path of life – life that triumphs even in death. If you cannot gather with us I invite you to think on your own: what is causing you to need a reset button? What individual choices do you need to let go and let die, what communal challenges are weighing you down, what sins of church and nation and world do we need to repent of? Mark them, burn them, and let them go… and take up life. Be re-set on the path God desires for you. Street Preaching? Let Your Life Speak! If you are personally connected to me at all, or you are a part of my blogs very small following, you will not have missed my participating in advocacy on behalf of the gay and transgender community both for marriage equality and now for the #AddtheWords movement trying to get the words “sexual orientation” and “gender identity” added to Idaho’s Human Rights Act. 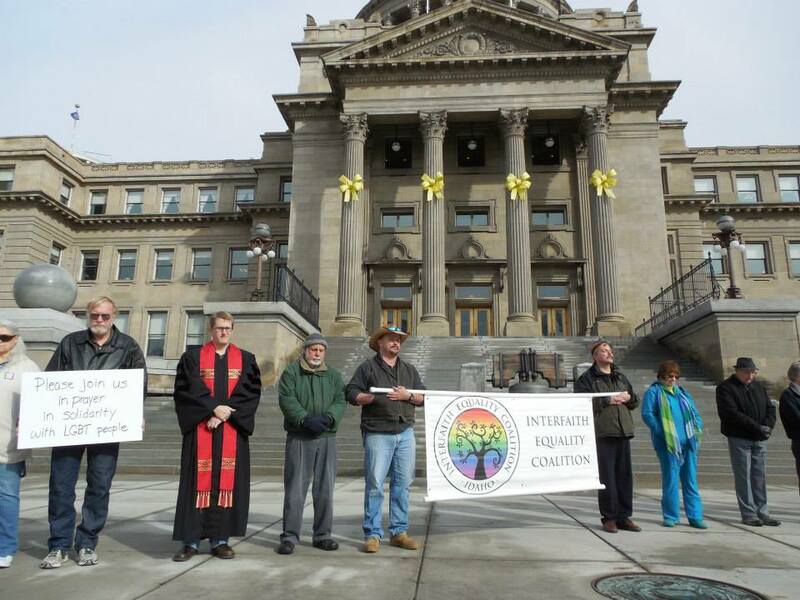 Interfaith prayer in solidarity for our LGBT community on the steps of the Idaho State Capital. We do this every Wednesday through the legislative session from 12 -12:45pm. This image was taken by Debbie Mallis on 2/4/15. I’m not sure if that friend even meant anything by that last comment. But I’ve reflected quite a bit on it. What does the robe mean when I wear it? It is just a preaching robe? And if it’s a preaching robe should I be wearing in moments of advocacy out on the streets? I’m thinking on this partly because I will confess that I don’t like wearing my robe at these events. It makes me uncomfortable. It feels in varying ways: pretentious, out of place, self-important… but I wear it. I wear it because I’ve been repeatedly asked to. The robe symbolizes religious establishment and authority and the role of leadership in the church and when a major force holding back LGBT equality IS the religious establishment people want to see that symbol used to endorse that equality. People are turning bibles into weapons to hurl condemnation… so we also need to show them bibles and churches as messages of love that build bridges, tear down walls, and offer sacramental inclusion. Here I stand. I will offer you the same awareness of blessing, the same service of washing, the same meal at the table… you are as welcome to my love and community as anyone else. This is good news. This is THE good news; this is the Gospel. And… this is preaching. You have probably heard it quoted before, from St Francis (see foot note below about that), “Preach the Gospel at all times, if necessary use words.” The sentiment reminds us that our deeds and our words need to both “preach” the same message. It is incarnation theology. We need to “make flesh” the ideas we believe. What we do – our actions – in the world tell a story. Our actions preach. So what are they preaching? Are they preaching the story we wish they would? Are they preaching the gospel? If every day we are basically writing the next chapter of our book… we are, each of us, in the act of writing our own Acts of the Apostles. How does it read? Mine is a pretty winding road… more winding; less pretty. But as I was standing out on the Idaho State Capital steps this morning in silent prayer for our legislature and the LGBT community whose vulnerability our legislature will not fully acknowledge or protect, this is what I was thinking. And what I realized was. This is preaching. My robe belongs here. This means as much or more than any 15 minutes I have spent in the pulpit of a church – my life is the pulpit and here I stand today… preaching. As far as I can tell there is no actual documented place St. Francis of Assisi said this, and multiple places name it a misquote or mis-attribution. There are comments in his writing about the journey and the message needing to be the same. That is about as close as he comes to this actual quote. This doesn’t make the thought wrong, and it doesn’t mean he may not have agreed with the thought, it does means the thought isn’t given authority by being “from him.” The authority it does have is on the basis of being true to you. The words unchristian is one I have heard a lot lately, from many people, in many different ways. I find myself on occasion tempted to use it. It is one of those words I wish to unname. It needs to be unnamed. It needs to not be used anymore, by anyone. The problem is the word presumes authority. It presumes that my interpretation of faith is the correct one and that allows me to establish firm lines to be drawn between that which is Christian |and| that which is unChristian. The word Christian itself has come to be used to describe a person or group or corporate entity who puts faith in Jesus Christ as the self-revelation of God. It is not a word that Jesus ever used. The word first pops up in Antioch well after Jesus’ death (Acts 11). It is not even the word first used to describe Jesus’ followers. His first disciples, become apostles as he sent them into the world, were described most often as “followers of the way.” Jesus live a way of life, and those who “came after him” were those who attempted to follow him – and his way – in the living of their own lives. Today I was in a bible study on Mark 1. And the part that really stayed with me was: “And Simon and his companions hunted for him. When they found him, they said to him, “Everyone is searching for you.”” (Mark 1:36,37) Jesus had gone off to pray and they hunted for him. The Greek word here gives a meaning of “to hunt, to track, to follow.” So while we often may think of the idea of “following Jesus” like students following their teacher down a well-lit hallway… the connotation here is more challenging than that. They are having to discern, to track him down, to seek out and try not to lose their way in following the clues Jesus left behind. And this speaks to me. This speaks to me of the kind of teacher who answered very few questions, asked many more questions, and taught in parables that intentionally confused and challenged first (traditional/face-value) reading. Jesus’ way is elusive and fleeting. Not weak. Not lacking substance kind of fleeting. I mean Jesus way has a humility around certainty and truth that challenges our desires to make absolute claims. Moses gave ten clear laws on his mountain; Jesus gave ambiguous and challenging character traits like meek, hungry and thirsty, mourning, and persecuted. How do we follow that way? We follow that way as one without authority (to borrow a page from Fred Craddock). We follow as one who is always tracking, seeking after, following a teacher who will not be pinned down to easy platitudes and clear legal systems. We follow that way by being one whose proclamation asks far more questions than answers. And we must remember that Jesus spends most of this time asking these questions of his religious tradition and authorities (in keeping with a habit of that same religious tradition – he isn’t the first to question). It’s popular to say that Jesus is counter-cultural. But we must remember that the culture he lives in is deeply steeped in religion. Jesus is AS MUCH counter-religious as he is counter-cultural. We cannot follow in Jesus way without being deeply skeptical of our own tradition(s) and authority(ies). So back to that unchristian word. Let’s get provocative for a moment. Jesus is unchristian. If there is anyone out there with more at stake in being unchristian its Jesus. Because the last thing Jesus seems to want is a bunch of self-authorized people speaking for him and telling other people what to do in his name. Jesus doesn’t want us to be sure of ourselves and self-righteous about our faith. Jesus wants us seeking, without authority, to follow in his way of questioning and questing after faithfulness to the living God – being made free and building people up. The idea of unchristian presumes that I know Jesus’ singular way to live and I know you aren’t living it. This kind of certain and clearly defined way seems far closer to idolatry than to the way of Jesus which must be sought and hunted after – even when it looks exactly like the way I would want to look, ESPECIALLY when it looks exactly how I would want it to look. I see and know many different ways to follow Jesus. The map of the way is full of winding paths: as different as Peter and Paul and everything in between. And there is something scary beautiful about that. I do not know that we can do without the word Christian anymore – I think that boat has sailed. But I dearly hope we can remove the word unchristian from usage, for Jesus’ sake.